I don't care what people say about pork...bacon is GOOD. I know where mine comes from, how it is raised, and even the people who raise them so I feel pretty dang good about eating it. But as with anything, moderation is important, and although you will be sorely tempted, eating this whole pan is probably not a good idea! Cooking bacon, albeit seemingly easy, does require some degree of patience. Here is my recipe for perfection. Preheat an oven to 400 degrees. 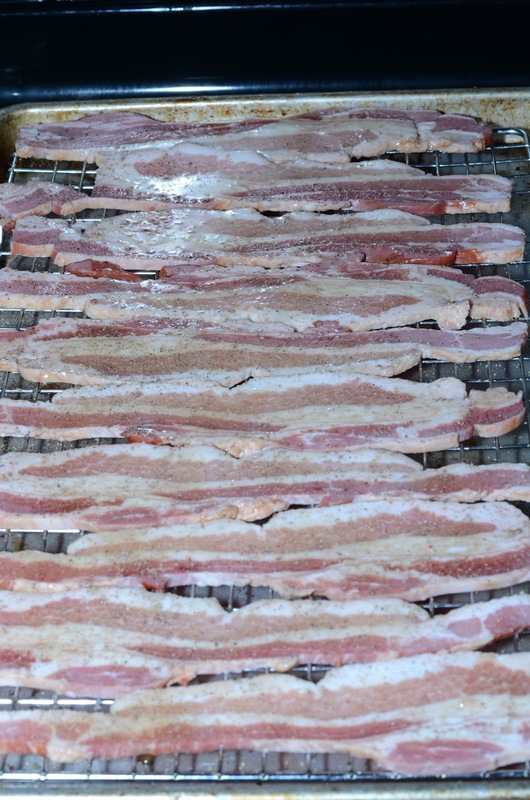 Place a cooling rack inside of a sheet pan and put bacon strips on rack. This allows the fat to drip and for them to cook evenly. Using a basting brush, light coat each strip with maple syrup and then generously pepper. Cook about 10-15 minutes, depending on thickness, and to your desired doneness. 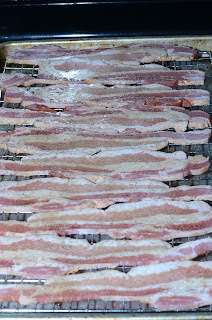 When it isn't so freaking cold outside, I prefer to do this on the grill because I hate smelling like bacon two days later...regardless of the ventilation, it still lingers through the whole house!